September 11th is the Catalan National day known as the Diada. Though a national day, it is more a day of commemoration, rememberance and politics than a day of celebration. The date is the anniversary of the fall of Barcelona, and so Catalonia, to the Bourbon Spanish in 1714 at the end of the War of Spanish Succession. Next year will be the 300th anniversay and in recent times the day has been marked by a great outpouring of hope and wishes for Catalan independence. Last year more than a million people were out on the streets of Barcelona. 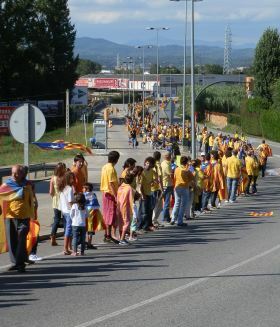 This year was marked by a linking of hand in a human chain that stretched 400km from Le Perthus in the north to the southern border with Communitat de Valencia in the South. (The photos are from the Via Catalan at Fornells, just south of Girona). As with most people arriving in Spain, when we arrived several years ago, we weren't particularly aware of Catalan nationalism. We would have known more about the demands for Basque Country independence. If you don't know the history it can seem strange that the national day commemorates the takeover of Catalonia by Spain. Surely Catalonia was always Spanish? The history of Catalonia is long, confusing and vanishes in parts. In many ways it is like a romantic tragedy with a people yearning for self-determination only to see it snatched away at the last instant each time. The history is also confusing, because Catalonia hasn't really been independent in its history. It has always been intertwined with Spain in one way or another. 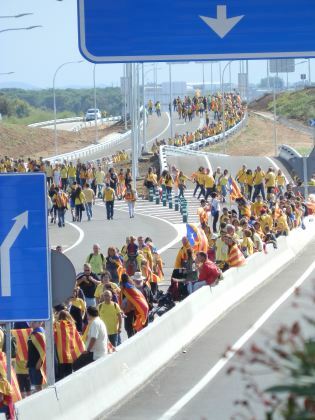 The modern independence movement and Catalan history as taught in schools idealises the great flowering of Catalonia between its formation in around 700 as a march (a semi-autonomous border territory) between the Franks and Moors of Spain, and its high point in the middle of the fourteenth century when Catalans controlled territories across the Mediterranean all the way to Athens. However, as modern Spain grew out of the amalgamation of the Spanish kingdoms and principalities via the unions by marriage of the various kings and queens, Catalonia slowly became marginalised, though it maintained its own governance and laws as the kingdoms within Spain kept to a loose federal structure. For instance, Catalonia had its own parliament from 1057 - the oldest in Europe and 200 years early than England and kings had to present themselves to the Catalans to be legitimised. As the kingdoms coallesced in the thirteenth and fourteenth century's, Catalonia's rulling family married into the kingdom of Aragon and became the kings of a united Aragon (Aragon was a kingdom, with Catalonia was a collection of Duchy's and the principality of Girona). The empire claimed for Catalonia is more properly the Aragon empire. Around the end of the fourteenth century and the beginning of the fifteenth century, Catalonia started to struggle and began to lose influence. The black death decimated the population and the crown and court started to become entwined with the larger neighbouring kingdom of Castille. Catalonia went through an economic crisis followed by a civil war (1462-1472) which vastly diminished Catalonia's political power and allowed the burgeoning French kingdom to interfere both wooing and betraying different Catalan interests. The result was that though Spain discovered America in 1492 with the consequent riches the Spanish empire brought, the rights to trade in America were restricted to the Castillans who only licensed trade ships from Cadiz and the ports in the north. Spain was growing rich, but for Catalonia it was a time of hardship and kowtowing to the dominant Castillans (known as La Decadencia and skipped over in much of Catalan history). And while Spanish Galleons were reaping their bounty in the Americas, the Catalan coast was being raided by Barbary Pirates - more strictly Corsairs agents of and supported by the Ottoman empire out of Constantinople the dominant force in the Mediterranean. The Spanish empire continued to flourish through marriage leading to Holy Roman Emperor Charles V becoming Carles I of Spain (1516) bringing his northern European dominions in the Low Countries into the Spanish fold so countries like the Netherlands became a Spanish territory for instance. Spain was the first worldwide empire on which the 'sun never sets', but Catalonia was still just a marginal outpost. And then the military expense of wars and battles to stave off revolts in this grand empire hit, and the empire started to disintegrate with revolts in the Netherlands and conflict with Britain and France..
Catalonia had only a marginal part in a Spain dominated by the Castillians and felt it was suffering indignities at the hands of the Spanish army leading to another uprising (the Reapers War or Catalan Revolt in 1640-52). This led to a self-proclaimed short-lived Catalan Republic in the year of 1641 under French protection. However, the French were playing their own game and in 1652 took Catalonia North, formally coming to an agreement with the Spanish in the Treaty of the Pyrenees of 1659. The Spanish conflict with France re-emerged in the Netherlands and Germany leading Spain to look to strengthen its borders. But it did so imposing taxes on Catalonia for fortification and soldiers (which is why there are the great fortresses and ciutadellas on the French and Spanish side of the border) leading to the revolt of the Barretinas. Stymied, broken and betrayed between the politics of the great powers of Spain and France, Catalonia had a chance for revenge in the Spanish War of Succession - a grand European struggle played out across the continent between the house of Bourbon (the French kings) and the house of Hapsburgs (of Austria and the Holy Roman Empire). The lack of an heir to Charles II of Spain who was also the Holy Roman Emperor meant Spain was caught between the two major families of Europe leading to a long and very complicated war that involved most of Europe. The British played for their own interests supporting the Hasburgs and taking possession of Menorca at one point, and eventually getting Gibraltar to accept the Bourbon king. Marlborough House outside Oxford is the direct result of the successes of the Duke of Marlborough in this war, though his part was played out in Spanish Netherlands and Germany. At the time of the war, despite the ups and downs in Spain's fortunes, Spain remained broadly federalised as it had since the middle ages. So when the time came to choose, the Catalans remembering the way they had been used by the French and still against the Castillians, chose to side with the Hapsburgs. Much of the rest of Spain was pro-Bourbon for Philip V a grandson of Louis XIV of France. As had happened before, Catalonia was on the wrong side and was squeezed by the power politics of its grand European neighbours. In 1714 on September 11th, the Bourbon Spanish under the control of Duke of Berwick (taking French colours - his uncle the Duke of Marlborough fought for the British-supported Hapsburgs) broke the seige of Barcelona and Catalonia was taken over by the Spanish. Not in the federated way of the past, but in a crushing takeover in an imperial style like Louis XIV had done France, centralising control and stripping away local customs and laws. Catalan institutions were closed and central Spanish control put in their place. Catalan was discouraged and Castillan Spanish promoted. Basically Catalonia was subjected to the new Spanish King's will. This is the reason for the Diada. In the eighteenth century, across the rest of Europe great figures of the Enlightenment emerged but as with the period of La Decadencia, Catalan history disappears, subjugated by Spanish influence. Not until the 19th Century did Catalonia find its voice again during the Reneixement - a flowering of Catalan national hopes and increasing interest in the older medieval history of Catalonia. By the start of the 20th Century Catalonia blossomed as the centre of modernism and the roots of modern art and an economic engine for Spain. And in the 1930s under the Spanish Republic, Catalans thought they could at last be independent. Hopes that were dashed by the civil war victory of Franco and his overbearing dictatorship. Catalans fled. Catalan was banned and Catalan politicians were shot. Within living memory are indviduals forced to learn in Spanish at school. And others who worked subversively to teach Catalan and keep Catalonia alive as an idea during Franco's reign. With the return of democracy the old ideas and dreams have returned, and Catalonia seeks its chance once more. This is why 1.6m people came onto the streets to call for Catalan independence this year.